I’m really happy to be reading with Tamar Yoseloff, whose collaboration with artist David Harker, Nowheres has just been launched. Sue Rose‘s book The Cost of Keys is one I’ve come to admire, especially her poem A Guided Tour that I wrote about recently. Sarah Barnsley is Telltale’s newest recruit and her pamphlet The Fire Station is going to be a major event. 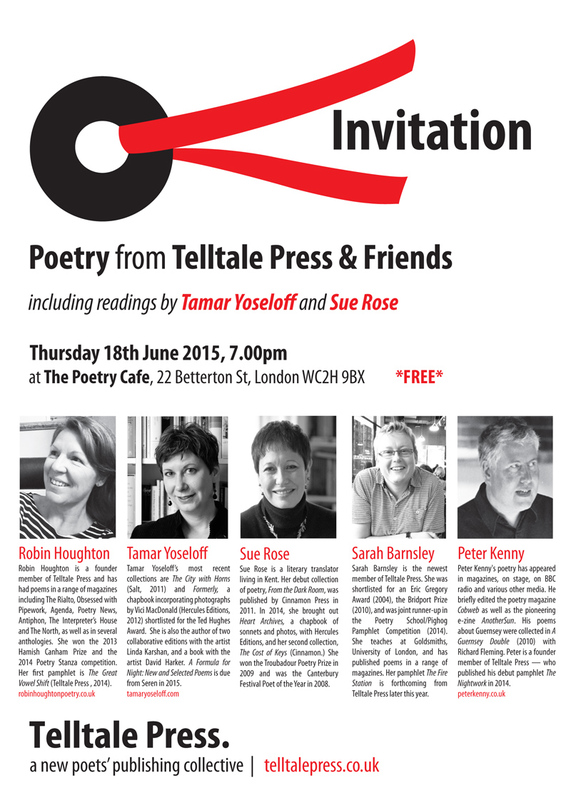 Add Robin Houghton whose readings have become increasingly dramatic and assured and it’s going to be a cracker. This entry was posted in Poetry, Reading, Telltale Press and tagged Nowheres, Peter Kenny, Robin Houghton, Sarah Barnsley, Sue Rose, Tamar Yoseloff, The Cost of Keys, The Poetry Cafe. Bookmark the permalink.